There is no good reason why pianist Gabriel Chodos has not been featured on these pages until now. 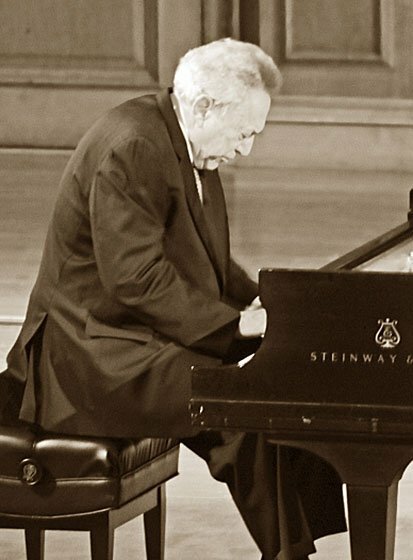 Since former New England Conservatory President Gunther Schuller appointed him to the piano faculty a quarter-century ago, Chodos has been an essential figure and mainstay as both teacher* and performer. His annual faculty recitals have always been important, much anticipated events—especially when he has been playing Schubert, the touchstone in the sensibility of any poetic pianist. Chodos’s performance of the last three Schubert sonatas at his NEC recital a couple of years ago entered the pantheon, as did his subsequent recording for Fleur de Son. What we hear in Chodos’s Schubert are directness, warmth, calm, and patient profundity. The tone has weight and substance but can also be fleet. He sustains engagement in the most vanishing of pianissimos and produces thunder without banging. His interpretative and technical arsenals are compleat. The performance of the G Major took us to another sphere altogether and departed from us in the tiniest whispering still small voice. To Beethoven’s opus 111 he brought a Schubertian sensibility—the angularity and abruptness were there, but Chodos found in addition a repose and songfulness that are not always obvious. He began the Maestoso with ringing and heroic tone. The Arietta was accompanied by the requisite metaphysical immersion, climbing step by step to a reassuring affirmation underlined by a superlative rendering of the longest trill Beethoven ever wrote, before subsiding gracefully into soulful annihilation. Zhu Xiao-Mei: She is a professor at the Paris Conservatory and she has a huge career in France. Her book, titled “La Rivière et son secret,” written in 2007, was a best-seller in France and it has been translated into English under the title “The Secret Piano.” The translation, as well as many of her CD’s, are listed on Amazon.com. Cathy Fuller: As everyone knows, she is a main figure (the chief figure?) for music on WCRB. Peter Sykes: Distinguished Organist and Harpsichordist, Head of the Early Music Department at Boston University. Hye-Young Lee: Professor of Piano at Sookmyung University in Seoul, Korea. Bravo, Lee! I too have long enjoyed Gabriel Chodos’ annual recitals and appreciated his way with this repertoire. In particular, he has a natural affinity for the contemplative side of Schubert, which deeply burnishes the composer’s subsequent outpourings of passion, anguish, and heroism. This affinity was everywhere to be heard last night in D.915 and 894, as Schubert’s wistful sonorities were given the space again and again to bloom and fade. As I hear it, over the years Chodos’ artistry and wisdom have deepened, but he seems always to have had this soulfulness – a gift for gravitas. Is there any piano faculty in the world anywhere near the level of playing, insight, breadth of immersion in the entire repertoire, and just amazing piano-playing of these guys? It’s remarkable! And with the observance of the D. 894 exposition repeat we got a full, wonderful 48 minutes of this glorious sonata. This concert was and will remain one of the touchstones of my concert-going years. Also, for perhaps the first time ever I was happy that a performer closed the keyboard cover rather than play an encore (despite at least four standing-O call backs.) Having been transported (in part by that trill) to paradise with the last notes of Beethoven’s last piano sonata, how could anything else have been anything but an anticlimax. Perfection. Thank you, Lee, for writing this appreciation. Gabriel Chodos has long been in my trinity of piano gods along with Till Fellner and more recently Meng-Chieh Liu. Mr. Chodos’s playing is profoundly moving to me and I always marvel at his tendency to let the music breath and his ability to make silence musical. His playing is ravishing and he transports us through a lifetime of emotions in a two hour concert. That there were so many NEC faculty members in attendance says so much for this incredible artist. Mr. Chodos, thank you, and please play again soon for us.